Going to the Washington State Fair on the last day might not sound like the best idea, but for some busy people such as my girlfriend and I, it was the only choice we had. 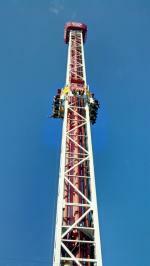 So, on Sunday, September 21, we made our way down to Puyallup for the final day of the 2014 fair. It was a fun day filled with food, rides, shopping and bulls. 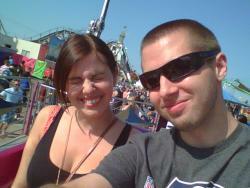 We left Seattle Southside around noon and arrived at the fair after only thirty minutes. We thought that there would be more traffic for the last day of the fair, but I guess we just lucked out. 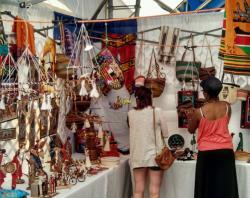 We started out in one of the shopping tents where my girlfriend found an African handmade craft shop. She ended up purchasing a handmade purse for $25. You couldn’t go ten minutes into the fair without buying an accessory could you, Tiffany? 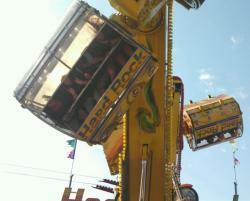 After the purse purchase, we made our way to our favorite fair attraction, the rides! My girlfriend and I are heavy hitters and high rollers when it comes to amusement park fair rides, so we splurged and purchased 120 ride and game tickets for $50. With the exception of the Extreme Scream (pictured to the right) most rides cost around eight tickets, so we were going to have our fair share of motion sickness on this particular day. We started out with the mid-level rides which were made up predominantly of various rides that spin you right round, baby, right round and oftentimes, upside down as well. We very much enjoyed these rides, but some were better than others. If you have ever suffered from motion sickness after a ride, I would advise against the “Hard Rock” which is a ride that forces you to flip nonstop, while spinning for around two and a half minutes. This one required us to take a break from the rides and get some lunch. My girlfriend decided to go with a classic fair burger with grilled onions and seasoned curly fries. She was quite satisfied with her selection, but threw away a few grilled onions because, “it was a little overkill.” The fair burger was a safe choice, but I wanted to take it to the extreme. So, I decided to buy a giant western sausage. 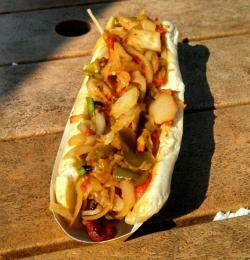 This behemoth sausage was about 14 inches in a bun and came loaded with grilled onions and peppers. Now, I consider myself a man who likes to eat and rarely leaves leftovers. But with the giant western sausage, I finally met my match. After digging in with my plastic knife and fork, I wasn’t even able to finish half of the monster culinary creation. Still not prepared to return to the rides, we made our way into the morbidly named “Beef Barn” to see some of the largest bulls this side of the Mississippi! My girlfriend loved seeing these big boys relaxing with bales of hay, as well as the young calves staying close to their mothers. I would also highly recommend the smell inside the barn for the fair purists out there. After the bulls, we made our way to the next barn where we were able to pet and feed some pygmy goats! The little guys enjoyed their meal almost as much as we did ours. 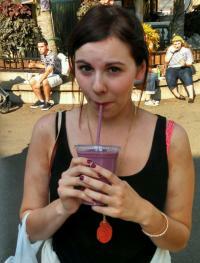 Finally, our stomachs had settled enough that we were able to return to the rides. We headed right for the granddaddy of all fair rides, the “Extreme Scream.” This ride is for experienced thrill seekers only and it is our favorite ride each and every year. This year did not disappoint as the drop from the top was just as shocking as ever! The Extreme Scream costs $10 (or 20 tickets) but I would argue that it’s worth every penny. By this point, we had been at the fair for around three and a half hours and we were about ready to head home. We had around thirty tickets left for rides and games, but we were pretty tired. Fortunately, the tickets don’t expire so we decided to save them for next year. We picked up a blueberry-pomegranate smoothie to cool down and settle our stomachs (again) on the way out that was very refreshing. Overall, going to the fair on the last day wasn’t bad at all and we are looking forward to going again next year!